Today the guys are talking about how rottenly spoiled the Boston sports fan base is, particularly those 30 years and under. Simply put, Moran is convinced they can’t relate to other sports fan bases. 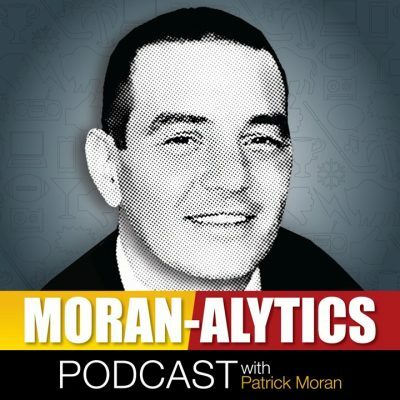 As evidence, Moran points out how over the last 18 years the Patriots have been to the playoffs 17 times (with six championships), the Red Sox 10 times (four championships), the Celtics 14 times (one championship) and Bruins 12 times (one championship.) Meanwhile the Buffalo Bills have seen one playoff game during that span with the Sabres in danger of missing the playoffs for an eighth straight year. They also talk about the Bills being tied with Arizona for dead last in next year’s Super Bowl champion odds at 150-to-1 while debating the future of Bills running back and biggest “star” player Lesean McCoy. They also deliberate the significance of another Carolina connection, Ken Dorsey being added to the Buffalo coaching staff. They also talk a little WWE regarding Becky Lynch, Charlotte Flair and Dean Ambrose before Joe (@buffalowins) manages to work in church, germs and handshaking reluctance all in one take. Moran ends the segment pondering if he’ll ever forgive Joe for not immediately recognizing one of the most iconic songs of the 1980s. Moran also has a take on NBA superstar/oversensitive jerk Kevin Durant in the podcast opening and admits he’s stoked for the Grammy’s on Sunday thanks to Alicia Keys later in the episode.